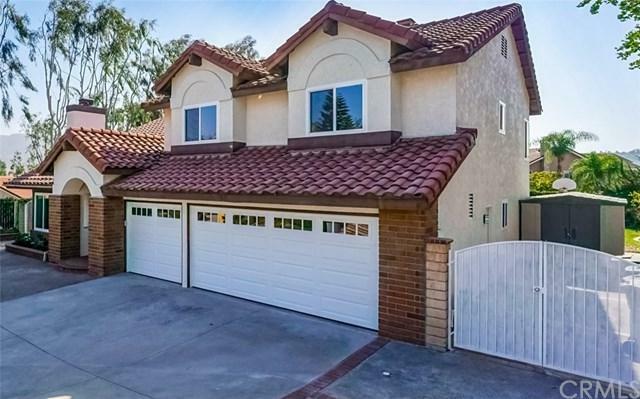 Nestled within the highly desirable Bryant Ranch community of Yorba Linda, this updated home has only been owned by the original homeowner and boasts 4 bedrooms 2 3/4 bath with 1 bedroom and bathroom downstairs and 2,856 Sq Ft of living space on a 10,080 Sq Ft lot. An open and airy floor plan with vaulted ceilings has plenty of natural light streaming through all new dual pane windows throughout the home. The extra large Master suite includes a cozy fireplace, a relaxing retreat and a balcony with a view of the valley. Every bathroom has been fully remodeled and updated. The kitchen has been thoroughly remodeled with brand new stainless steel appliances, range, stove, microwave, dishwasher and refrigerator. The water heater, furnace and air conditioning units have been replaced and are 6 years new. Located within the award winning Placentia - Yorba Linda School District and just minutes to shopping, restaurants and entertainment with quick access to the 91 Fwy. This move-in ready home is a must see!